John D. Bassett III knows about the decline of American manufacturing all too well, but he refuses to give up. Bassett and his sons, Doug and Wyatt, represent the third and fourth generations of their family to run the Galax-based business. John Bassett led, and eventually won, an anti-dumping campaign against China, which resulted in duties being placed on Chinese-made wooden bedroom furniture imported into the U.S. Companies “dump” a product on the market when they export it at a price that is either below its manufacturing costs or its home-market value. The money received from the duties enabled Bassett to keep 700 people employed at the company’s factory in Galax, a city of about 7,000 people that once had six furniture plants. Today, Vaughan-Bassett prides itself in making all of its furniture in the U.S. and being the largest manufacturer of wood bedroom furniture in the nation. The company shouldn’t be confused with Bassett Furniture Industries Inc., a separate, publicly traded furniture company based in Bassett, a Henry County community. Bassett’s grandfather, J.D., co-founded Bassett Furniture in 1902 as well as Vaughan-Bassett Furniture Co. in 1919. His story led former Roanoke Times reporter Beth Macy to write “Factory Man,” which became a New York Times best-seller and brought the company more exposure. Macy’s book also attracted the attention of Tom Hanks’ film production company, Playtone, and HBO, which is developing the story into a miniseries. 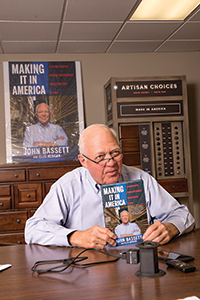 Earlier this year John Bassett released his own book, “Making It In America,” billed as a 12-point plan for developing a business and keeping jobs in the U.S. While offshoring had the biggest impact on the company during the last decade, a bigger issue this decade has been recovering from the Great Recession. New housing sales and construction have not returned to prerecession levels, says Doug Bassett. For the last few years, Vaughan-Bassett’s annual revenue has ranged from $80 million to $90 million, the company says. One way the company hopes to increase sales is through its Artisan & Post Division, a new solid-wood furniture division it introduced in the spring. The division, which now offers bedroom furniture, will add dining-room furniture in October. Vaughan-Bassett hasn’t made dining-room furniture in the last half-dozen years. “We’re really expanding our line to give us a shot at more slots on a [furniture] dealer’s floor,” Doug Bassett says. 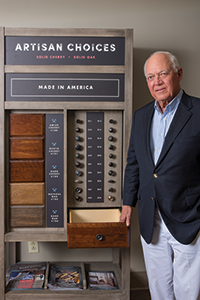 Virginia Business interviewed John Bassett at Vaughan-Bassett’s headquarters in Galax. An edited transcript of the conversation is below. Virginia Business: What made you decide to write the book, “Making it in America”? My book is not for the ladies’ book club. If you want another way to run a company, maybe you want to consider this, maybe you don’t. That’s it. VB: [Your book is a 12-point plan for growing a business and keeping jobs at home.] If you had to pick the most important thing— can you pick one? Bassett: No, I’m not going to pick the most important thing. I’ve told them from the very beginning there were five great rules … They said we need more than five so we ended up with 12, but what you really want is those five rules. The second rule is leadership. I’m not talking about the golden parachutes, the guy at the top getting all of the stock options and all that. No, no, no. I’m talking about teamwork and leadership that they teach in the United States military … If you’re a young second lieutenant or first lieutenant … you have to lead your troops. If you lead your troops, you have to get in there with them. You can’t sit in some office 300 miles away and tell somebody, “Close that factory down in Alabama.” We went and worked with our people. … Every day [our workers] were seeing factories [in Virginia and in North Carolina] close. [The employees] look at you and say, “Do you really think you can do this?” We had to get them in the right frame of mind, attitude. We had to lead them, and we led them by example. No. 3 is you have to be willing to change and improve again, again and again … Right now we’re spending $2 million on our boilers to reach all the EPA standards they want us to reach between now and January, and we’re doing it. [The company is complying with Environmental Protection Agency’s Boiler MACT rule, designed to curb emissions of hazardous air pollutants from industrial boilers and process heaters.] But if you’re going to have all this, you can’t have a poorly organized and inefficient operation. VB: How has your life [and the company] changed since “Factory Man” was published? People knew Bassett [Furniture Industries Inc.], and they many times still think we’re Bassett … At first they would say, “There goes John, there goes Don Quixote, he’s fighting windmills again,” and etc., but, as this went along, people started paying attention and said, “Wow, maybe these people are on to something.” So I think, overall, it changed people’s opinion of what we are. VB: [Is there] anything Virginia can do specifically to help keep jobs in America or that we could do better? Bassett: Retraining. … Western Virginia had a lot of furniture factories, wood-furniture factories. You had a lot of apparel factories, textile factories. All of those types of factories basically disappeared, and those people need jobs, and we need to do a better job of retraining people. A.L. Philpott, who was from Bassett, when he was speaker of the House [of Delegates] pushed for 58 [to have four lanes] all the way to the Kentucky border. We need to do that. We need good infrastructure going west because roads make all the difference in the world. You’ve got to get stuff in. You’ve got to get stuff out. VB: Our audience is [made up of] executives, CEOs. What in your opinion makes a good leader? Bassett: Don’t ask your people to do anything that you’re not willing to do yourself. In the Army, they call it “set the example.” You don’t tell that soldier to get out of the foxhole. You get out first and [then] tell him. VB: Are you involved with the community college or do you have any apprenticeships? Bassett: We do not have a formal program … I’ll tell you where we get a lot of our young people. Their fathers or uncles will come in and say, “I have a young man I want y’all to [hire]…,” and they mentor that person, family members and that type of thing. We’re beginning to grow again. We weathered the tsunami. We could have gone under. This thing was … brutal, but they didn’t get us, and we fought tooth and toenail … [Now] we’re back into solid furniture and … being a company that really knows how to use real wood. There are techniques that you need. I mean you just don’t go and slap this stuff together. … We do it with very modern equipment, don’t misunderstand me, but it is beginning to have real traction. VB: Are you having to replace a lot of older workers like a lot of other manufacturing industries? VB: [When there were six plants here,] how many people were employed? Then you have all the different people. The suppliers. The people that supplied the hardware. The people that supplied the finished material. The people that supplied the cartons. Martinsville used to have like five carton plants for all of this … When you say a plant closes, if you go look at your suppliers, if the plant gets rid of 500 people, generally, there’s 500 people somewhere else that lose their jobs, too. Gone. So it was interesting, it really was. VB: What was it like when you first read “Factory Man?” What was your reaction? Bassett: That this is going to upset some people … I knew she had touched some nerves. VB: [You said you agreed to be interviewed for “Factory Man” but refused to talk about your family]. Were you afraid that bad stuff was going to come out? I don’t criticize other people for what they did, but I hate to see America turn tail and run all the time. I mean we can do this if we’re willing to believe in ourselves again. We think the only thing we can compete in is maybe a brand-new product that nobody’s heard of before, but then we’ll invent it, and then we’ll run over to Asia and get it made over there. We don’t even give the guys over here a chance … People say, “We got to be an innovator.” Do you know where a lot of innovation comes from? Right off that [factory] floor out there.